Sri Lanka has moved up three notches and ranked fifth in the 2016 World Giving Index (WGI) compiled by the UK based Charities Aid Foundation (CAF) and released on Monday. 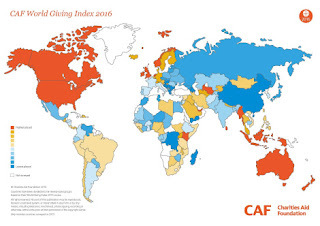 About 148,000 people in 140 countries were surveyed as part of the Gallup World Poll by the CAF to compile this year’s index, which looked at sub categories of number of people donating money, participation in helping a stranger and participation in volunteering time. Sri Lanka was ranked eight last year and ninth, the year before. Myanmar continues to top the list as the most generous country in the world followed by the US, Australia, New Zealand and Sri Lanka. “Myanmar maintains its number one ranking seen in 2015 but its position has grown stronger as the 2016 score is now five percentage points higher than its five year average. Other countries with strong upward trends this year are Sri Lanka, Indonesia, the United Arab Emirates (UAE) and Kenya,” the index report said. Emerging eastern world power, China ranked at the bottom of the index as the least generous country followed by the Palestinian Territory, Yemen, Greece and the Democratic Republic of Congo which was ranked at 136. India, Sri Lanka’s neighboring country, ranked at 91, Pakistan at 92, Afghanistan at 78, Nepal at 39, Bhutan at 18 and Bangladesh at 94 in the index. John Low, Chief Executive of the CAF said the generosity of people, even in countries suffering from disaster and turmoil, was truly humbling. “It’s amazing that more than half the people in the world said they helped a stranger. In every country, people have this in-built desire to give and help others. Governments should encourage that spirit of generosity and create the environment in which a strong civil society can flourish allowing people to reach out to those less fortunate than themselves,” he said. The CAF is an international charity organisation registered in the UK, with a presence in nine countries covering six continents.